Over the centuries, the textile industry has undergone phenomenal technical progress. Weaving and knitting machines are amongst the most complex industrial equipments ever made. Test protocols for the evaluation of textile products have also evolved considerably. There is, however, one aspect of design and quality control that remains practically unchanged since the beginning of time, evaluating comfort. Most people have a clear idea of what comfort represents for them but when it comes to defining comfort in measurable terms, the clarity suddenly vanishes. The situation is the same for textile engineers for whom comfort has always been extremely difficult to deal with because of the numerous factors comprised in the concept of comfort. Moreover the importance of each of these factors varies from one individual to another. Comfort could not be addressed using normal scientific tools, it was left to personal appreciation. The main test, still used today is the ‘’hand test’’. It consists of taking a piece of fabric in the hand and feeling it. No quantitative measurement can be extracted from this subjective analysis. The best we can expect is a rating from a panel of individuals. There are three pillars for comfort: softness, dryness and smoothness. Although dryness is easily measurable and consists of measuring the humidity level, softness and smoothness are not so easy to quantify. A certain combination of the above characteristics will produce a degree of comfort but only one person attempted to measure comfort by attaching numbers to some of these tests. In the 70’s, Dr. Kawabata invented a series of machines designed to measure textile products. Very sensitive measurements on small pieces of fabric subjected to bending, torsion and elongation generated numbers. Obviously these numbers do not mean anything to the person on the street; in fact it does not mean much to the textile experts either. In order for the results produced by the Kawabata equipment to transpose in ‘’comfort units’’, a correlation must be conducted again with a panel of people expressing their impression on comfort on a comparative scale. Such a correlation is not readily available which explains why in 2005 researchers from the University of Philadelphia undertook this task. The Kawabata evaluation results are used as specs mainly in an effort to standardize rigidity given that rigidity is most probably the easiest measurable component in the Kawabata Evaluation System (KES). The KES systems measure fabric smoothness and frictional properties of a fabric surface, bending, compressive stiffness, tensile and tension. As fancy as they may be, measuring devices are meant to provide the manufacturer with adequate quality control protocols. The ultimate test happens when the customer opens the box and takes hold of the product. If the customer accepts the touch only then will she/he accept to wear it. Everyone also understands the sacred rule in textile product design and expects a trade off on comfort to obtain added protection. This is why it is preferable to wear only the required level of protection without over design in order to maximize comfort. In applications where protection is of utmost importance, such as first responders, military or operating room personnel, the challenge for the material/garment designer is to maintain the required protection while making it possible to conduct the expected operation. It is for these markets that the textile industry has been challenged to the maximum resulting in progress made available to the consumer through a wide range of composite textile materials even for underwear applications. 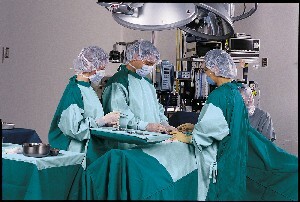 For example high moisture vapour permeability and fast wicking finish are now used in surgical gowns. Taking these once revolutionary innovations, ReleafTM adds a soft (brushed or napped) side to the textile. Thus, ReleafTM gives to this daily wearable product all the comfort and special protection that technology can offer.